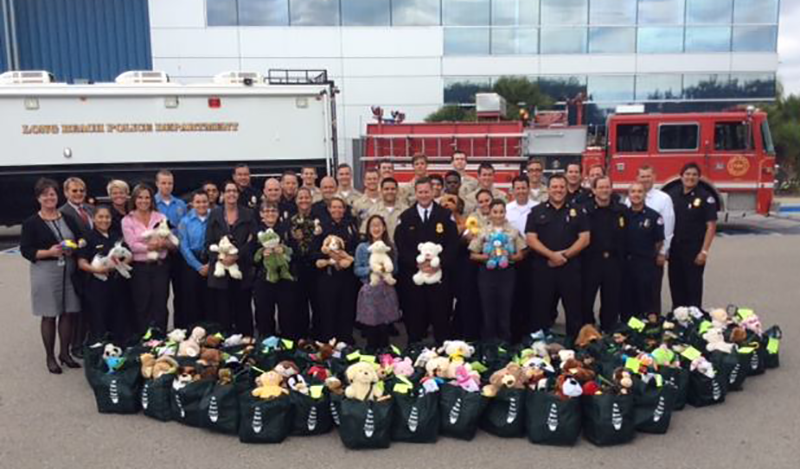 Jessica Carscadden (center) with members of the Long Beach Police and Fire Departments, and the 85 bags of stuffed animals she donated today. Photo courtesy of the Long Beach Fire Department. One child is working to make the lives of thousands of other children brighter by donating toys to Southern California public safety departments, including 85 bags of stuffed animals that she donated to the Long Beach Police and Fire Departments today. The toys, ranging from stuffed bears to stuffed penguins, will be placed in patrol and rescue vehicles, as well as at LBPD and LBFD facilities. From there, they will be given to children involved in traumatic situations. To learn more about We Care Bears or to donate unneeded, gently used stuffed animals, click here.